Ethiopia is not only the cradle of mankind, it’s the birthplace of coffee. According to historian Antony Wild in Coffee: A Dark History, Lucy and her prehistoric friends might even have been chewing on the beans. Later, the first roasted coffee was likely made in the Ethiopian highlands where the coffee plant is indigenous. This bit of history is a source of great pride for Ethiopians, and coffee is a big deal here. 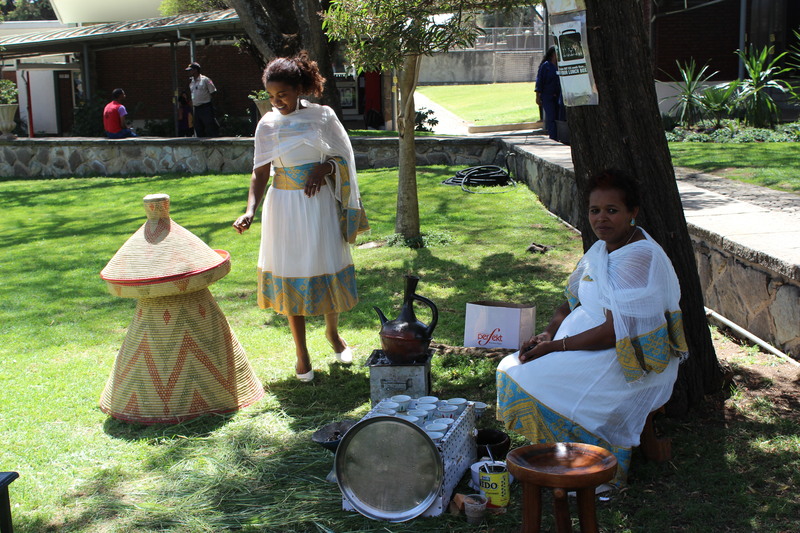 Special events – visitors, the opening of a new shop, new babies, retirements, graduations – are always celebrated with a traditional coffee ceremony. According to Ethiopian tradition, coffee’s special properties were first discovered by a goatherd named Kaldi. One day Kaldi noticed his goats dancing around in a particularly energetic fashion. He observed the frolicsome herd eating red berries from a certain bush. He gathered some of the berries and took them home to his wife, who figured out how to roast, grind, and boil them to make a drink (there are other versions of the story involving holy men, but I like the resourceful wife motif). 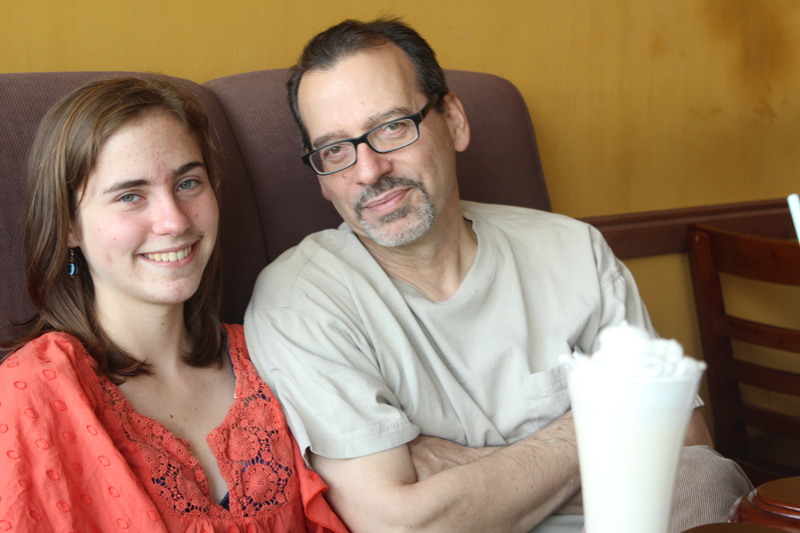 Pretty soon Kaldi and his wife were selling coffee beans locally and to the traders who carried them overseas. The rest, as they say, is history. 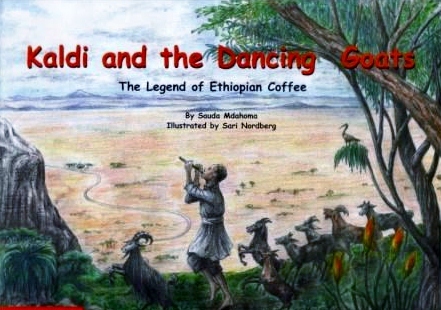 There is a chain of coffeehouses in Addis Ababa named after Kaldi the goatherd. It’s the Ethiopian version of Starbucks. There is no actual Starbucks here, just like there is no McDonalds or Chili’s or KFC (no overseas chains or franchises at all, in fact), because of regulations protecting domestic commerce. 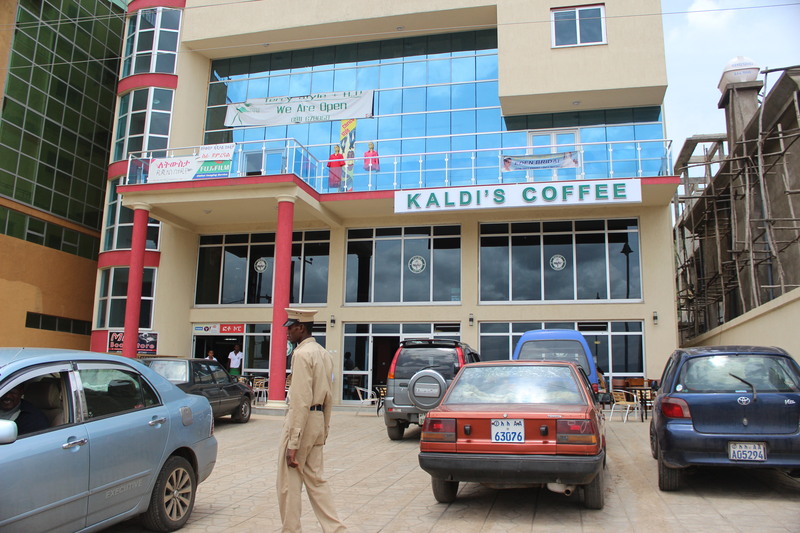 Kaldi’s offers espresso drinks, ice cream (an unusual treat in Ethiopia), cakes, sandwiches, and other light fare. Last fall, there was a new building under construction a couple of blocks up the street from our apartment building. In our early days at the school, before we had cars and ICS provided a bus for the Varnero faranji to ride to and from Lebu, our upstairs neighbor Nella would always remark when we drove by the growing glass and chrome structure: “that’s going to be a Kaldi’s.” Ha ha. Good joke, Nella – there’s nothing out here but cows and goats. Nella was right. Last month the building finally opened up, and the first two floors are a new Kaldi’s. Now that’s progress! This entry was posted in Addis Ababa, Background, Food. Bookmark the permalink. Kaldi, how I miss you! I lost count of the number of kilograms of coffee I smuggled back to the UK with me every time I went home. There’s nothing like Ethiopian coffee, enjoy while you can!